I love to kayak when I travel! It’s a good way to get closer to nature and see the area from a different perspective. Plus, another benefit of kayaking is that you can get some exercise. The scenic views and breathtaking landscapes will make all the effort worth it! With over 250,000 rivers, too many lakes to count, two oceans, and the Gulf of Mexico, the kayaking options in the United States are endless! Where should you start? Keep reading for details on the best places to kayak in the US. When you are traveling, depending on your skill level, it might be best to do a kayak tour instead of going kayaking on your own. In most cases, when you do a kayak tour, all the kayaking equipment is provided for you. All kayaking tours are not for everyone though. It’s especially important to make sure the kayak tour is appropriate for you if you are a beginner. You want it to be an enjoyable experience, not one that is frustrating. Plus, you need to be able to keep up with the rest of the tour group. There are countless amazing kayaking spots in the US. I wanted to pull together a sample so that you would get an idea of the diversity that the country has to offer, so I asked some travel bloggers to share their favorite kayaking vacation moments. You might be surprised to learn that you can even find some fantastic kayaking inside major cities. One of my most memorable places to kayak in the USA is Shingle Creek Regional Park in Kissimmee Florida. This waterway at the headwaters of the Everglades is very calm and serene. 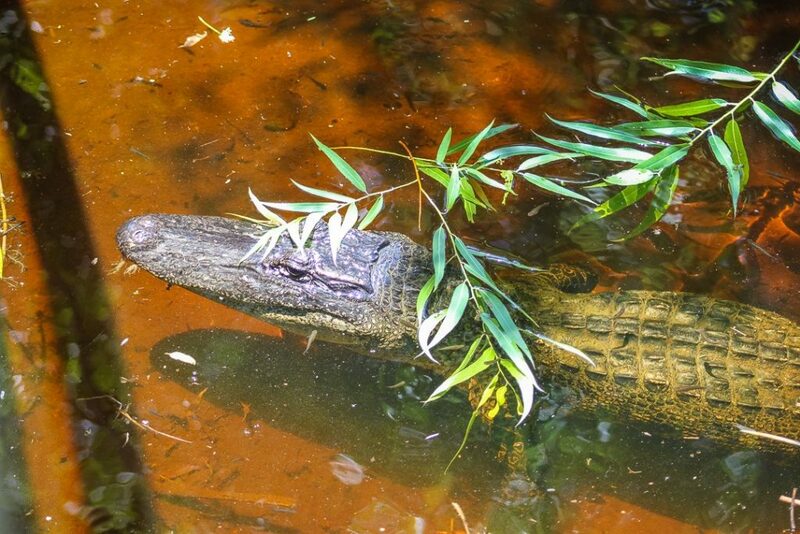 It’s an easy paddle and a picturesque one with views of Cypress trees, turtles, birds and if you are lucky (or unlucky based on how you see it) alligators. Once you are on the water, you forget that you are in a major tourist area because you don’t hear any traffic noise or people. All you hear is the sound of silence which is so surprising considering that Shingles Creek is located off of Hwy 192 and close to all the tourist attractions and theme parks. If you are looking for a beautiful place to kayak, then you must visit the Florida Keys. 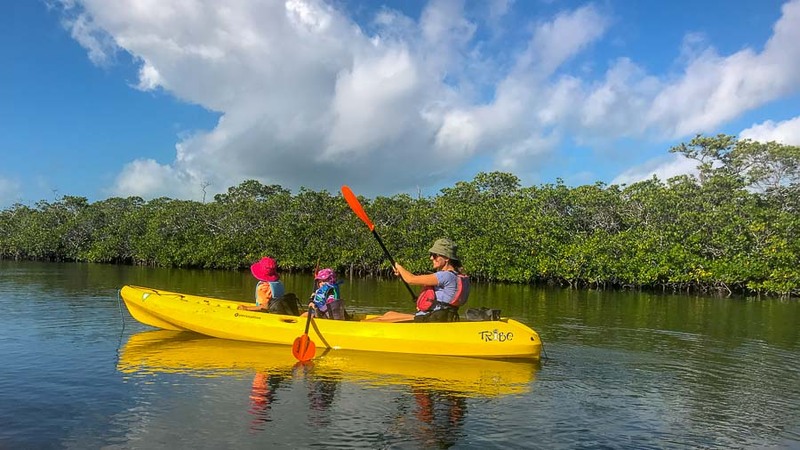 Not only would you be able to explore a simple bucket list destination such as Key Largo, but you would be able to kayak in the calm mangroves of John Pennekamp Coral Reef State Park. Key Largo is located just 65 miles south of Miami, FL. When you arrive in the Keys it almost feels like you took a trip to a tropical island somewhere….oh wait, you did! Yet, you can take the trip in your car or RV! Our full-time traveling family of 6 hasn’t had a lot of experience kayaking, but if you ask our 8-year-old what her favorite memory of full-time travel last year was, she’ll tell you kayaking in the Florida Keys! We loved it so much that we are planning our Winter travels to the Florida Keys once again and plan to do some amazing family-friendly kayaking! I never thought I would say this, but I just love kayaking in Buffalo! If you haven’t been to this great city, then there are a few things you should know. Buffalo has completely re-imagined its waterfront. As a result of this massive redevelopment two new neighborhoods have formed known as Riverworks and Canalside and both offer great Kayaking. 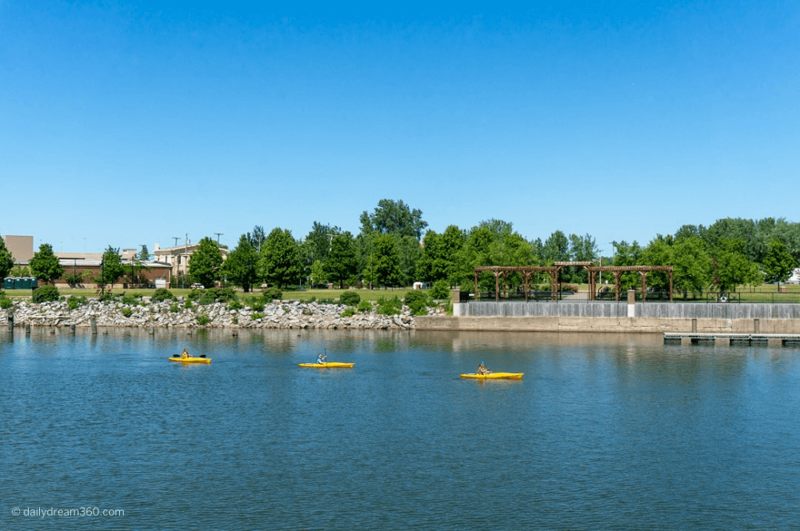 My favorite place to kayak in Buffalo is at the Riverworks Adventure and Entertainment Complex. You will recognize it by the massive 6-pack of Labatt Blue beer cans which are painted over the old grain silos. The smell of sweet Cheerios wafts in the air as you Kayak amongst the concrete silos in the Buffalo Harbor. Paddleboarders and little Tiki Bar boats also putter around the harbor and when it is all done you can relax on shore with a beverage from the massive outdoor bar. 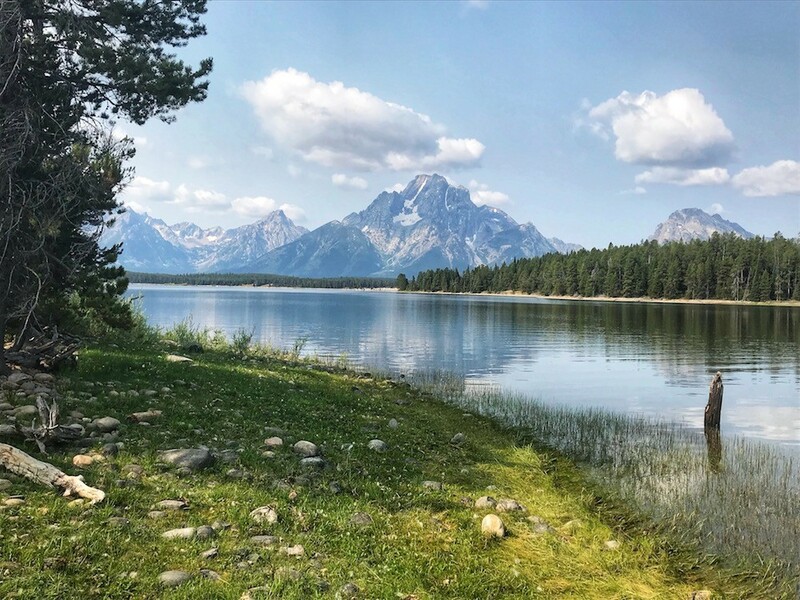 Grand Teton National Park in Wyoming—located just south of it’s more famous cousin Yellowstone National Park—is an idyllic location for kayaking. In addition to the mighty Snake River for American bald eagle spotting, there are dozens of languid lakes to choose from. String Lake is a popular choice as it connects Jenny Lake and Leigh Lake (but you’ll need to plan a quick portage to paddle on Leigh Lake). Our favorite was the clear and placid Lake Jackson. Even mid-day in summer, there were just a handful of others sharing the lake…the only sounds were our paddles breaking the water and calls from geese at the nearby bird refuge. You’ll paddle out of Coulter Bay alongside any number of deserted little islands for sunning or a quick swim break. You can even rent a kayak lakeside! it’s just one of many things to do in Grand Teton National Park. The Wailua River on the beautiful island of Kaua’i is an amazing kayaking destination. The river is one of the longest in the state of Hawaii (20 miles! ), is lined with gorgeous palm trees, and is home to several beautiful spots to explore. Stop (or start!) at the Kamokila Hawaiian Village to learn about native Hawaiian lifestyles and habitats. Go inside their authentic hunts and enjoy some of their plant remedies. Dock at Fern Grotto, a fern-covered lava rock grotto, and explore the birds, plants, and flowers in the natural amphitheater. Park your kayak along the shore for a couple of hours and hike to Uluwehi Falls (also known as the Secret Falls) to view one of the island’s most beautiful waterfalls. Splash around in the refreshing water and enjoy the rope swings that you’ll find along the way (but be sure to follow the island’s posted suggestions to avoid leptospirosis). 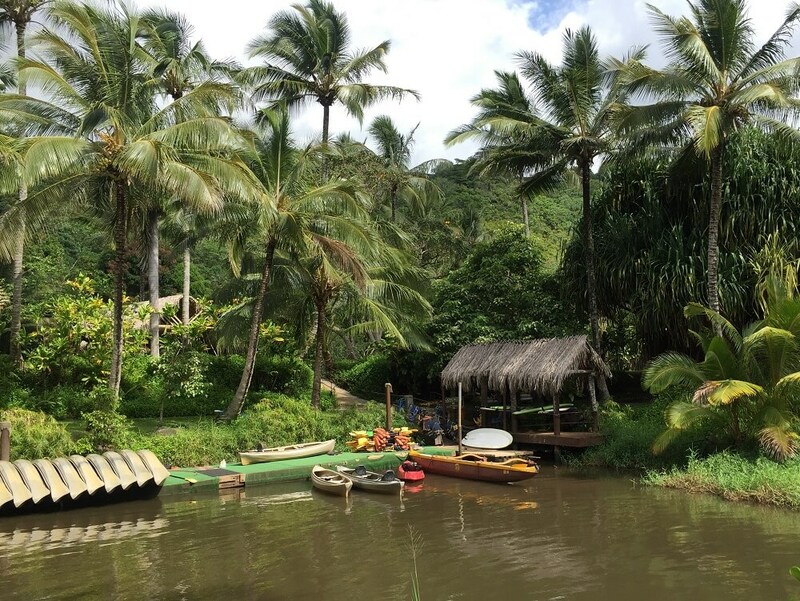 Overall, the Wailua River is a beautiful destination for travelers who love to make kayaking a part of their adventure. When you go to a big city like Chicago you don’t automatically think about kayaking. 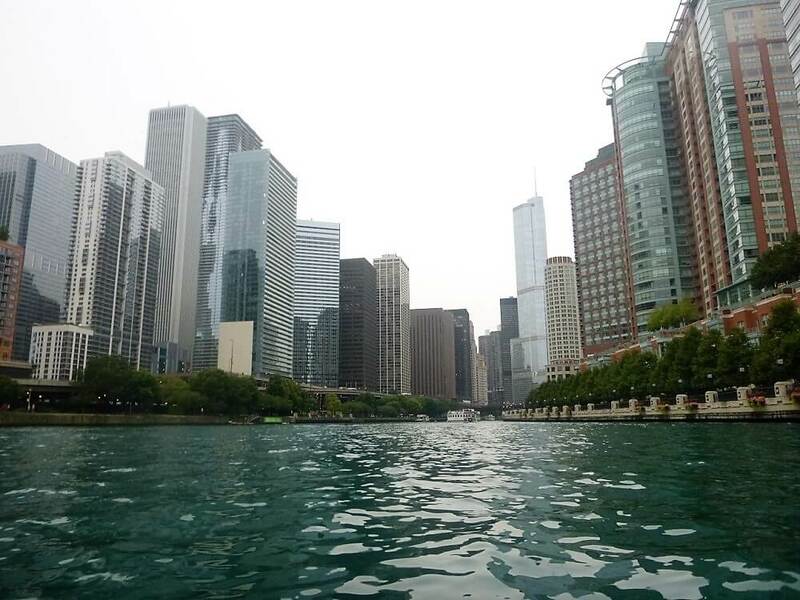 Most people opt to take a cruise along the river to see the buildings and hear the history but while I was researching what to do, I found out there was an option to kayak the main branch of the Chicago River. It was great to get away from the concrete jungle and noise of the traffic and to get some exercise. It is not too hard a kayak and you are out for around 90 minutes, you stop quite frequently so that the guide can give you the history and stories of the buildings that you are seeing and the history of Chicago. If you enjoy kayaking or just want an alternative to the cruise then it’s a great way to see a little part of the city. I started kayaking as a way to explore nature and get out of the city. However, I soon learned that urban kayaking is equally fun! This summer, I spent a long weekend in Memphis, Tennessee and had the chance to paddle the Mississippi River. Memphis is best known as the birthplace of Rock N Roll, but at heart, it’s a Mississippi River town. Kayak rentals and guided tours are available from Kayaker Allen. I highly suggest the guided tour, as you’ll learn a lot of history about Memphis, and he can help you safely navigate around barge and steam-wheeler traffic on the river. 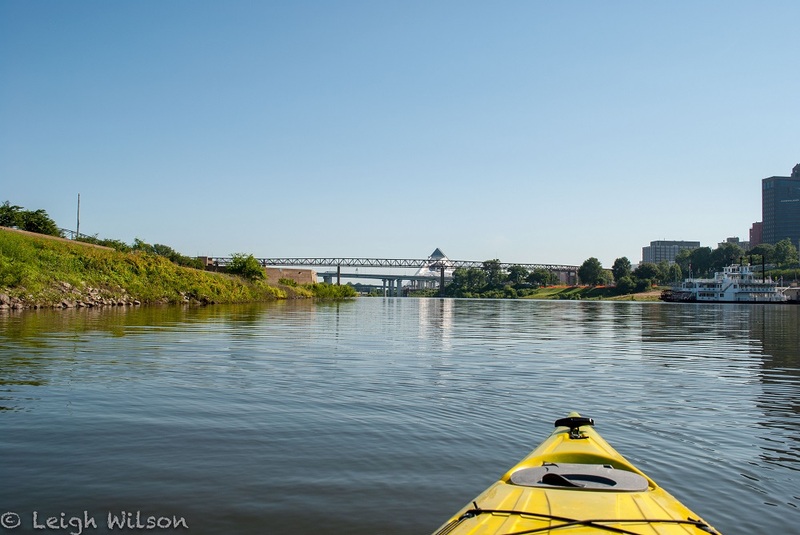 It’s a great chance to get a view of the Memphis skyline that most don’t see, not to mention paddling alongside a 150’ barge. Paddling the Mississippi River in Memphis is the perfect mix of nature and urban landscapes. Sea kayaking in Alaska is wild and rugged. To get to Kachemack, we had to drive six hours south of Anchorage to catch a boat ferry out to the park across the bay. On the way, we were hitting waves about three and a half feet tall, and I kept thinking that I hoped it wouldn’t be so rough for the kayaks. It wasn’t. We were camping on the island, and our kayaks were safe on shore. We woke up early to get them in the water. The sea was a bit rougher than I like it, much rougher than lake kayaking, but it was fun. We saw all kinds of water birds, but the highlight of the trip was the otters. There was an entire family of them floating nearby. 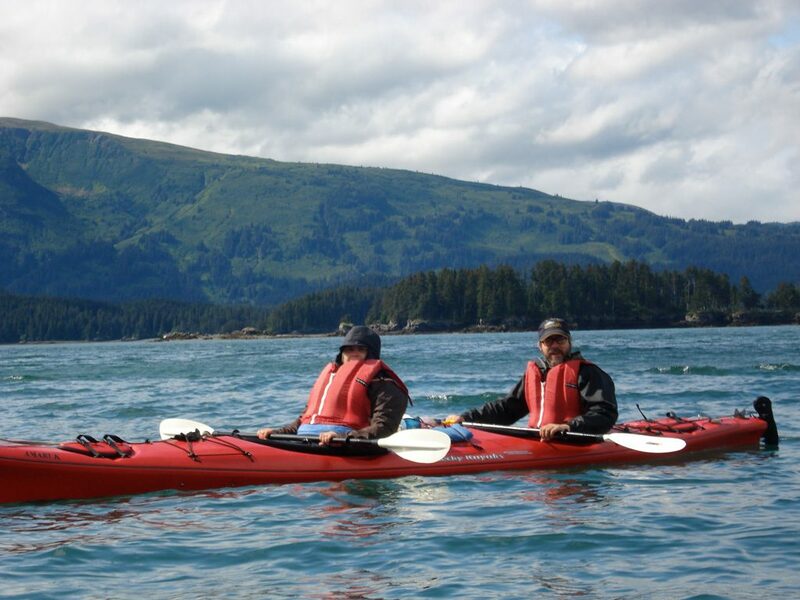 Alaska is the best place to kayak and really see some wildlife at the same time. 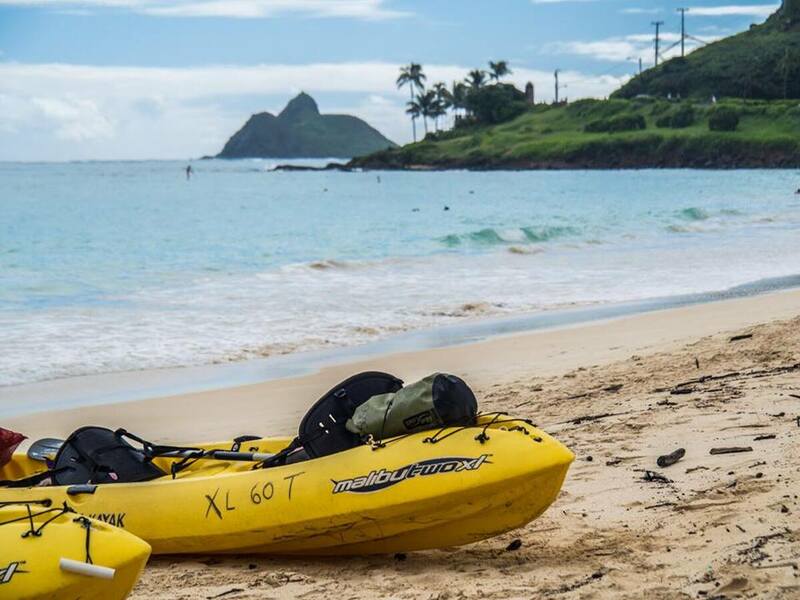 One of the best places to kayak in the US is Kailua, Hawaii on the windward coast of Oahu. What makes it such a special experience? The views! Kailua is sandwiched between the ocean and the massive Ko’olau mountain range. It’s only once you’re out on the water that you can truly get a sense of the stunning, lush beauty of the mountains that cut the island in two. From out on the water you can see how each fold leads into the next, and after a big rain, you’ll even see spontaneous waterfalls running down. If the scenery on land isn’t enough, you’ll have the pleasure of kayaking around the famous clear waters and patch reefs of Lanikai as you head out to “the Mokes”. Mokulua and Moku Iki, the twin island bird sanctuaries are just a 45-minute paddle from Kailua Beach. Once you land on Mokulua you can even hike around parts of the island to explore places rarely visited by humans. Of course, you can’t kayak in Kailua Bay without hopping in the water with a snorkel! You’ll see a wide variety of local fish and, if you’re lucky like us, you’ll even get to swim with sea turtles. While most people associate New Orleans with Mardi Gras festivities or the charming architecture of the French Quarter, there are plenty of activities for outdoor enthusiasts in the Big Easy. If you like to go kayaking, then New Orleans has many bayou kayak trails in the Louisiana swamps. 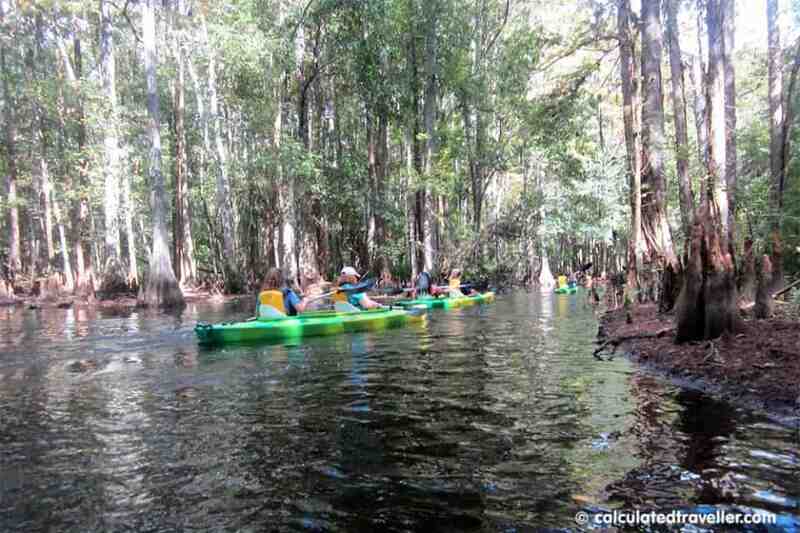 One of our favorite places to kayak was the Barataria Preserve of Jean Lafitte National Park but this has been closed in recent years due to hurricane damage and aquatic growth. However, there are plenty of other nearby areas where you can rent a kayak and go on guided trips through the moss-laden cypress trees and the bayous. From the safety of your canoe, you can spot alligators, water snakes, ospreys, egrets and other native birds in their natural habitat. Most of the tour guides are knowledgeable about the ecology of the Mississippi Delta and provide a fun, educational experience. If you want to keep on paddling after your vacation, check out my guides for information on some of the best gear on the market. There are inflatable kayaks for all ability-levels and budgets. If you like fishing, consider getting a fish finder to make your time out on the water a lot more productive. Don’t forget to always wear your PFD when kayaking! With the right equipment and a patch of water, anyone can kayak. I want this site to be a resource where you can find all the information you need to enjoy kayaking.